Finally, some real hero vs villain action. Peter Parker aka Spider-Man, now fully embracing his role as a protector of the innocent and sporting a sweet costume. He’s spent the last few months building up a reputation in the city as a mythical vigilante. Played by Tobey Maguire. Norman Osborn aka The Green Goblin, a millionaire inventor and industrialist whose rash experiment with his own enhancement formula has unleashed a murderous alter ego. In addition to making him go ax-crazy, the formula has given Osborn increased physical strength and stamina; between that and his armor, he’s more than enough to be a physical match for Spider-Man. He’s also the father of Peter’s best friend, which is a funny coincidence. Played by Willem Dafoe, national treasure and Doug Benson’s former bete noire. Armed with: In addition to his armor and helmet, the Goblin is rarely without his trusty jet-propelled glider, which is highly fast & maneuverable. More importantly, it’s outfitted with all sorts of guns, rockets, and (this will be important later), a retractable blade. And since I don’t see any pockets on that suit, it also seems to be where the Goblin stores his supply of pumpkin-themed grenades. 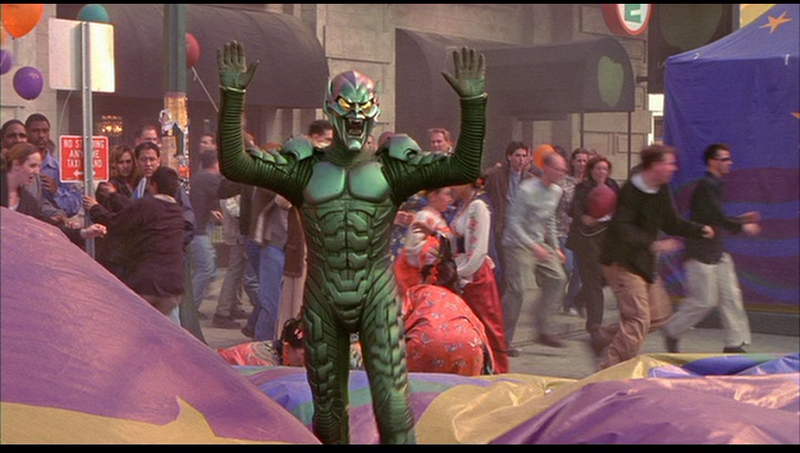 And because it’s inevitable: people LOVE to complain about the movie design of the Green Goblin, specifically his “Power Ranger” mask*. And, look, it’s not great– the mask is awkward for having an open mouth that doesn’t move, and the monochromatic color scheme gives off a distinct “naked” vibe– but it’s not that bad. And the complaints would be less grating if so many of them were not rooted in “they didn’t make it look like the comic,” which is only the zillionth example of nerds not understanding that something that works visually on a comics page or even a cartoon does not always translate well with actual human beings. Even if you could make the Goblin’s original look work on-screen, a lot of viewers would be scratching their heads as to why Osborn would go to the effort of dressing up like something straight out of Lord of the Rings; as it is, the implication that the Goblin helmet is an extension of Norman’s interest in tribal masks is quite sufficient. The Setup: At a “world unity fair” (are those a thing?) 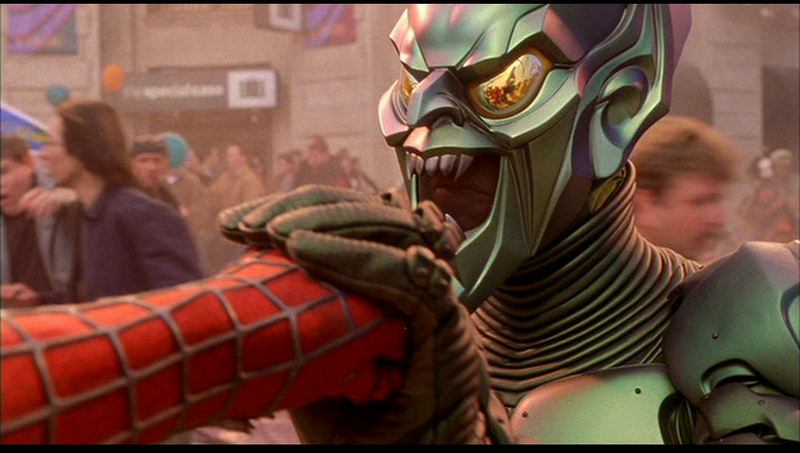 being attended by Peter, Mary Jane, and Harry– in addition to several hundred civilians and musical supervillain Macy Gray– the Green Goblin makes his public debut, gunning for the board members who had been planning to edge him out of his own company. That taken care of, Norman starts feeling a little randy, and he hovers near the terrified Miss Watson, lustily menacing her. Pervert. Still much more savory than what Marvel had him do to Gwen in the “Sins Past” storyline. 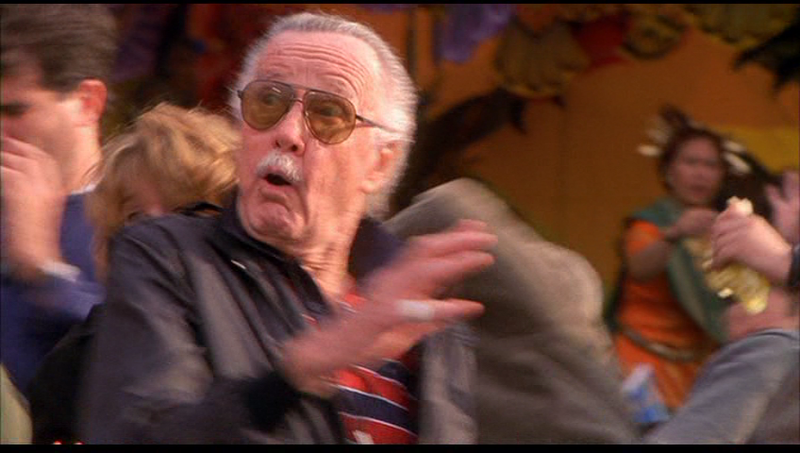 Fortunately, that’s when Peter comes swinging in in costume– complete with his arrival being announced by an exuberant girl pointing in the air and shouting “Look, it’s Spider-Man!” It’s adorably cheesy. Meanwhile, the Goblin rises to his feet with a cartoonishly angry growl. Several of New York’s finest approach him, at which point he raises his arms with a pointedly sarcastic “I surrender!” and proceeds to beat them up with ease. Sheesh, what happened to their guns? Anyway, Spidey approaches and tries his own luck. I mean, at most the metal helmet has a SLIGHT Lord Zedd vibe to it. Gobby stops the fist with a cheeky “impressive!” and then kicks the hero through some scenery. He hops back on his glider (apparently it has some sort of homing device that can take it back to him if he’s dislodged), and pursues him with automatic fire. It’s a little odd-looking because Spider-Man’s just running in a straight line directly in front of the glider, and the hail of bullets keeps landing on either side of him because the glider keeps moving in a straight line as well. Goblin finishes by launching a missile, which creates a suspiciously small explosion just as the hero web-slings away to safety. That crazy formula may have made him super-strong but he still shoots like a stormtrooper. Continuing to evade the villain, Spidey bounces amongst the remaining balloons and focuses on saving Mary Jane, whose position is getting more precarious by the second. 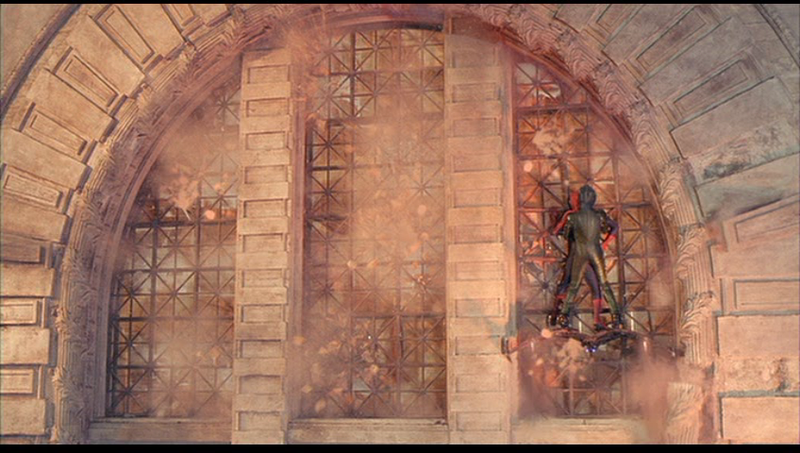 But just before he can arrive, Green Goblin swoops in on his glider and rams our hero into a huge set of windows. The visual is somewhat… unfortunate. There’s some decent scuffling after that, but Peter gets the worst of it and ends up falling down a bit when he’s knocked off the glider. The Goblin turns about but gets a face full of webbing, obscuring his vision. Spider-Man takes advantage of the distraction and rips a healthy chunk of wiring out of the glider’s undercarriage. His ride going haywire, the villain flies away spastically, crying out, “WE’LL MEET AGAIN, SPIDER-MAN!” so hammily it makes me wish Willem Dafoe was my dad. Peter then of course dives down and saves Mary Jane just before she takes a fatal fall. That’ll be the last time that happens, right? To say this is far from perfect would be an understatement. Characters make questionable tactical decisions. The CGI is not always convincing, and there’s a high visual contrast between the more aerial/acrobatic stuff and the up-close altercations. The scale of the fight is surprisingly limited, especially given the mobility of both fighters; it wouldn’t be until the sequel that Spidey finally had a truly proper city-spanning brawl. It is, nonetheless, ridiculously fun. Though he never really did nail the comic character’s trademark taunting, Maguire is solid as our hero. But it’s Dafoe who truly shines, hamming it up without even the barest lingering trace of irony. Dafoe has expressed regret in interviews that the nature of his mask prevented him from fully using his face to emote; he clearly attempts to compensate for that vocally, and how. He comes right up to that line where unacceptable cartooniness would begin, and presses against it like a mime in an invisible box. And for all its faults, this is most definitely a superhero fight. Though the action keeps within a small area it’s still dynamic, going from air to ground to air again, with both opponents employing a variety of different attacks. The sound design cranks up appropriately to sell even the more glancing blows, conveying the power involved here (Matrix Reloaded, this isn’t). I remember seeing this in the theater and thinking, “wow, I really am seeing it. 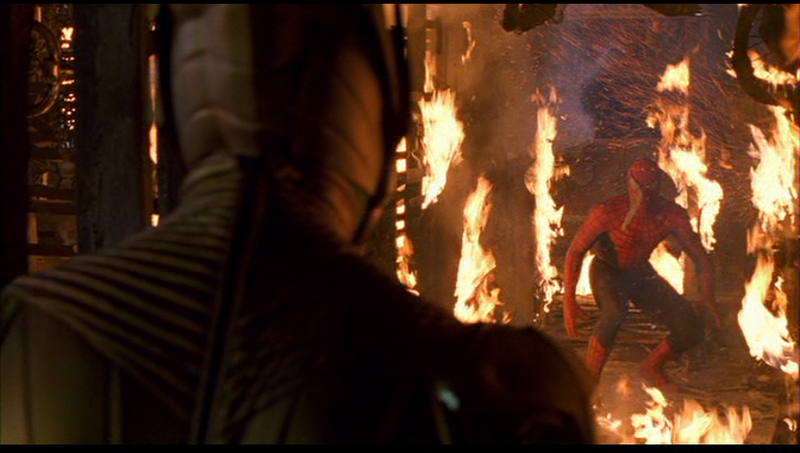 I’m seeing Spider-Man fight Green Goblin.” Like I said earlier, nowadays we take things like that for granted because we get to watch a full team of Avengers fight off an alien invasion and then go out for schwarma together afterwards, but in 2002, this was more than enough. Grade: B+. A very high one. Recommended Links: They actually did experiment with a more articulated Goblin mask, but oddly the problem with it was that it was too good. This is a character who should come off like a man dressing up in a monster-themed outfit, not an actual monster. Great Weird Al song about this movie. I still love Al even though he makes that same Power Ranger comment. Who deserves most of the credit for creating Spider-Man? Hint: it ain’t that guy in the first picture up top. This entry was posted in Spider-Man and tagged one-on-one, Spider-Man, superheroes.